Applications of univariate extreme value theory rely on certain as- sumptions. 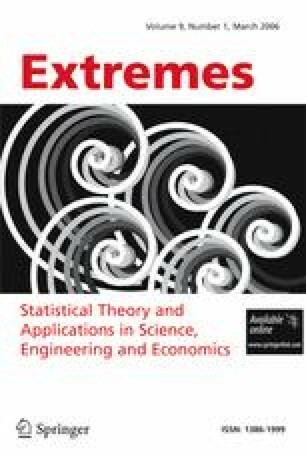 Recently, two methods for testing these extreme value conditions are derived by [Dietrich, D., de Haan, L., Hüsler, J., Extremes 5: 71–85, (2002)] and [Drees, H., de Haan, L., Li, D., J. Stat. Plan. Inference, 136: 3498–3538, (2006)]. In this paper we compare the two tests by simulations and investigate the effect of a possible weight function by choosing a parameter, the test error and the power of each test. The conclusions are useful for extreme value applications.